Paul Mitchell Shampoo and Patron Tequila billionaire John Paul DeJoria's new music focused prepaid MVNO, ROK Mobile is now available to the general public. The service, which was initially invite-only, now lets anyone with a credit card sign up. ROK offers a single plan priced at $49.99 which includes unlimited calling, messaging and data together with ROK's signature feature, unlimited music streaming and downloading. 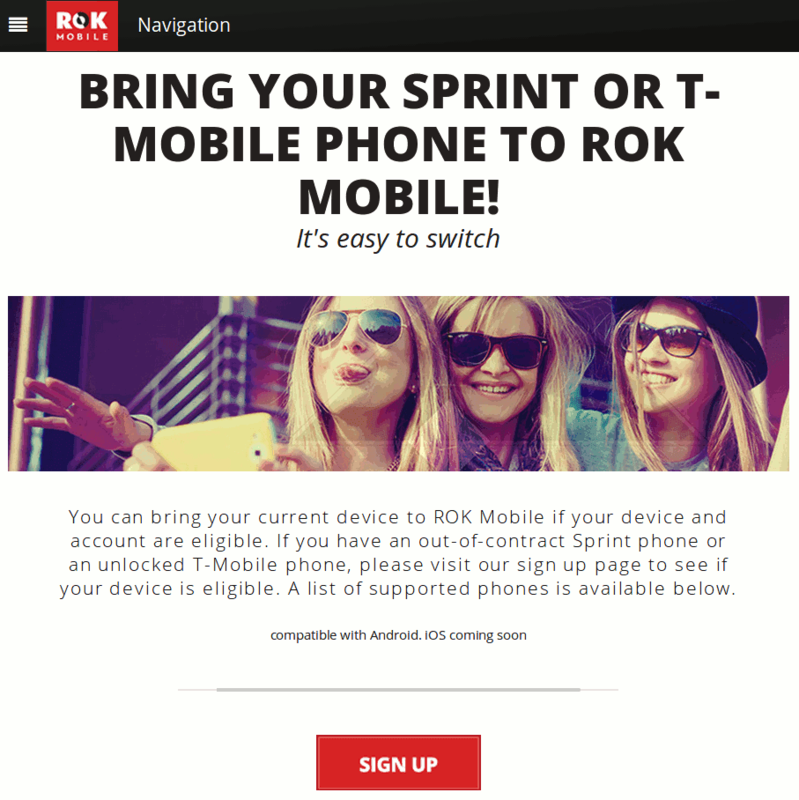 ROK runs on either the Sprint and T-Mobile networks depending on the phone used. ROK's music service lets users listen to personalized music streams and create their own playlists from a library of over 20 million songs. In addition to streaming, ROK users can download music for off line use but can not transfer downloaded music to another device. It's not clear if downloaded music will still play if the user cancels ROK service. Prospective users with an Android phone can test drive ROK's music service for 14 days free of charge. Go to rokmobile.com/trial to sign up. A phone number and email address is required. ROK will send a text to your phone with a link to download their app. ROK lets users activate a limited number of Sprint and T-Mobile phone models (list) which have been tested and approved for use with the service. The list of Sprint devices includes several, like the iPhone 5c and 5s, LG G2, G3 and G Flex, Motorola Moto X and Samsung Galaxy S5 and Note3, that are blacklisted by Sprint from activation on MVNOs because they were released less than a year ago. I'd be very surprised if ROK can actually activate these Blacklisted models. The site also has conflicting information as to whether iPhones can be activated or not. The eligible device list includes Sprint's iPhone 4, 4s and 5, as well as the 5c and 5s, but elsewhere on the site it says iPhone support is coming soon. There's no indication on the ROK site as to which network, T-Mobile or Sprint, the phones they sell use. ROK charges $10.01 for standard shipping on phone orders. SIM shipping appears to be free but there's a $25 activation fee. There are also additional monthly fees and taxes which vary by state. In California taxes and fees are $6.24/month. Even with fees, less than $60/month is an unbeatable price for unlimited talk, text, data and music. Of course it remains to be seen just how unlimited ROK service is. ROK's terms of service page says that ROK has the right to cap or throttle the data of anyone whose usage impacts "impacts the wireless network or ROK Mobile resources". Hotspot usage is specifically forbidden. ROK's terms are similar to other mobile operators and MVNOs, what really counts is how strictly they are enforced. I've asked ROK to clarify whether they can actually activate recent Sprint phones and which network the phones they sell use and will update this post when I know more. Do they support Windows phone? "Currently ROK Mobile supports iPhone and Android devices. At this time we have no plans to support Blackberry or Windows Phone." One funny thing is that ROK's BYOP page lists the Nokia 521 Windows Phone as a supported Sprint device. Is there a Sprint version of the Lumia 521? And do they really support the T-Mobile Lumia 521? There's no Sprint Lumia 521. ROK doesn't have a Windows phone app so a Lumia 521 wouldn't be able to use the streaming music feature. High Speed data limit? Throttling speed @? Do we have any info on these two questions? There's nothing about either on the site. They say you can bring your device to ROK if you have an unlocked T-Mobile phone. Does that mean locked T-Mobile phones won't work? And do they have LTE? I suspect that locked phones will work but we won't know for sure until someone tries it. They say that LTE and WiMAX work on compatible Sprint phones on ROK. They don't mention whether LTE works or not on T-Mobile. How is this anything like Solavei? ROK MOBILE did a re-launch today in the U.S. as a service available to everyone. Did anything actually change with this relaunch? Plan and prices look the same and ROK's been available to everyone for 11 months. I see Rok as a service geared towards preteens,teens and early adults up to 30 years old.Whom are ALWAYS using there phones for more of entertainment purposes rather than communications purposes. Service offerings have changed a lot in the past two years but it looks like Verizon is one of the networks they use.